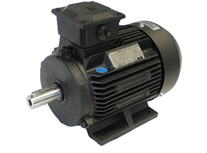 3 PH Cast Iron three-phase induction motors according to IEC/DIN-VDE0530. Terminal box top mounted, fixed cast feet. Voltage 380-420/660-720V, 50Hz, Insulation Class F, Protection IP55, Colour RAL5010, thermistors fitted as standard.